Tomorrow is a special anniversary for it will be 16 years since I walked out of the hospital finished with chemo and ready to face the world as a cancer survivor. I was terrified, relieved, excited, hopeful, anxious. Sixteen years later I still feel those emotions on a regular basis. Finishing treatment for cancer doesn’t mean you’re finished with the disease. If you’re blessed and lucky, the actual disease will stay away forever but the aftermath of treatment, both mentally and physically, continues to greet survivors daily. Of course I’d much rather face those challenges than the alternative of not being on Earth. 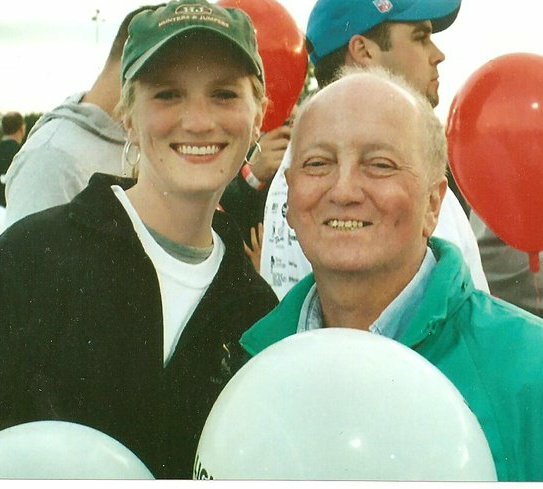 Next month, the 10-year anniversary of my dad’s death from cancer will occur. While we were diagnosed a year apart, our cancers were different enough that our paths split. Thoughts of my dad flit into my mind daily. Sometimes, it’s little things that make me miss him, such as knowing he’d help with a home project (he was a home builder) or his willingness to try the craft beers I like (even though he was a faithful Budweiser man). Other times, my heart aches for the major milestones he is missing, such as my wedding or the high school graduation of my niece. And, even though 10 years have passed, I still have the desire to share with him and ask his input on random things – successes at work, advice on marriage, family vacation stories, politics. I sometimes get taken aback at the strong urge to pick up the phone and talk to him. My dad knew his battle was ending, probably before all of us accepted it. While his spirit and mind continued to rally, his body was worn out after six years of treatment. In the months leading up to his death, we talked a lot. About how cancer changes you, his love for his family, his happiest memories, his childhood antics, my future. He was never an overly emotional person but his illness made him open up more to my mom, sisters and me. And in those moments he provided good life tips that only a father can share with his child. In honor of him and my cancer anniversary, I thought I’d share with you. Learn to laugh at yourself, and also laugh at the challenges life brings. I’ve learned your attitude can be a major factor in how life plays out. You can’t control everything in life so focus on what you can. Learn to forgive. It may be difficult to forget when someone hurts you but forgiving heals you. And saves you time and energy. Why exert so much negative energy? Maybe you choose not to keep a person in your life but then don’t let them have so much influence that you’re negatively impacted. What’s the point? Let people love you and surround you with laughter. You can’t truly love or be loved if you don’t open your heart and take risks. Don’t let work be your life because at the end of your breaths, people matter. Make time for them, enjoy them, love them. Love life. Always hold your head high and do things you can be proud of. Be loyal but don’t let people screw you over. Learn about life and the world around us, listen to others, try to solve a problem yourself (this helps you learn something new), travel outside of your hometown and if possible outside of the U.S. Step away from the television, computer and phone to open your eyes to the beauty and happy people around you. Enjoy life. Don’t spend your energy and time on people who don’t make time for you, including friends and family. Life is too short to spend it on people who don’t feel the same. We’re all busy, whether you’re single, married, parent, business owner, etc. It seems like people are always trying to be busier than someone else these days. I’ve learned to make efforts with those I care about but if it’s continuously not reciprocated, then I turn my energies to others who make efforts too (but I don’t harbor negative feelings towards those who didn’t make time for me. We choose our priorities and live with the outcomes.). Don’t carry the weight of the world on your shoulders. You can’t fix everyone’s problems or attitudes so focus on what you can. Treasure each day. Seriously, DO THIS. Appreciate being alive, time with your loved ones, your body, the breaths you take, the steps you walk and the opportunities you have. (Bonus) Love your parents for you never know when they won’t be there. It may seem odd to roll my cancer anniversary, a celebration, and the anniversary of my dad’s death into the same blog. But they are connected – being a cancer survivor and my dad’s death made me stronger, braver and much more appreciative of life. My dad fought cancer to the end and I continue to fight it daily by embracing those I love, taking advantage of opportunities and adventure, facing life with hope, standing strong for others when I can, laughing, breathing. What do you treasure and appreciate about life?